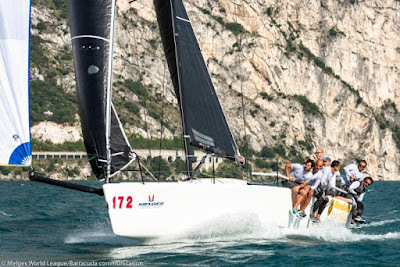 CAGLIARI, Italy (August 28, 2018) - The 2018 Melges 32 World League has officially arrived in Cagliari, a racing destination that is hailed as one of the very best in the world. It is the location for the final stage of the 2018 Melges 32 World League. This is the first of a long series of Melges events set to steal the spotlight in Cagliari. Both the Melges 20 World Championship on October 10-13, and the Melges 32 Worlds on October 17-20 will take place in Sardinia's capital city. "Finally, and with great pleasure our Classes return to Cagliari, a venue that does not need an introduction and a city with a huge heart that has welcomed us with great warmth. Never, until now has a location been so involved with this many consecutive Melges events, and some of the most important of the 2018 season," said Federico Michetti, president of Melges Europe. "This organization is very unique and could only be made possible here in Cagliari. It is where there is a very special relationship between sailing and the sea, professionalism and enthusiasm by the organizers of the highest caliber, which together guarantee success. Cagliari will remain a staple location throughout the 2018/19 winter season, and will host the 2019 Melges 24 World Championship where we expect over 100 boats." Over the next three days, from Thursday, August 30 - Saturday, September 1, everything will be decided for the 2018 Melges 32 World League regarding its long standing challenge which began last April in Forio d'Ischia. The Cagliari event (organized by Yacht Club Cagliari, Melges Europe and supported by dell'Autorità di Sistema Portuale del Mare di Sardegna, il Comune di Cagliari e la Regione Sardegna) is being presented as one of the most spectacular of all time in the history of the Class. The current 2018 Melges 32 World League Circuit Ranking showcases the Italian teams of Matteo Balestrero sailing GIOGI, and Vincenzo Onorato's MASCALZONE LATINO on equal terms. For Balestrero, it is his first time to be in contention to win a major Melges 32 World League title. For Onorato, he is the leader of the most decorated and legendary of Italian sailing teams. It's not possible for the showdown to be only about Balestrero and Onorato, as lurking close in the large shadows of third place is 2017 Melges 32 World League Circuit Champion Giangiacomo Serena di Lapigio aboard G.SPOT whose only goal is to win the trophy and defend his title. Germany's Christian Schwoerer at the helm of LA PERICOLOSA is the next closest in line for what could turn out to be his biggest success yet in the Melges 32 Class. "Cagliari and our Yacht Club are very excited to present a series of high-level international events with great commitment from our entire Organizing Committee," said Alberto Floris, Yacht Club Cagliari president. "When we received a request from our friends at Melges more than a year ago, we responded enthusiastically. We believe that in addition to the sport of sailing, these events generate a great deal of visibility for our city that yields high returns, and without hesitation further establishes Cagliari as a popular world capital of sailing." Thursday, August 30 will mark the first day of competition with racing getting underway at 13.30 local Cagliari time in front of Sant'Elia, visible from shore. 1.) (ITA) Matteo Balestrero/Branko Brcin, GIOGI; 54 pts.